Princess Charlotte pictures unveiled Jump to media player Kensington Palace release the first pictures of Princess Charlotte, with her brother Prince George, taken at their Norfolk home. First glimpse of new royal princess Jump to media player The Duke and Duchess of Cambridge have left St Mary's Hospital in Paddington with their baby daughter. Prince George arrives to meet sister Jump to media player The Duke of Cambridge brings Prince George to St Mary's Hospital to meet his new sister. Prince William 'very happy' with baby Jump to media player The Duke of Cambridge says he is "very happy" following the birth of his second child - a daughter. 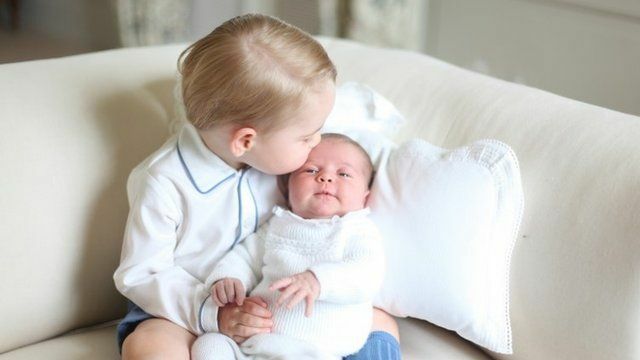 Kensington Palace has released four photographs of Princess Charlotte with her brother Prince George. The palace tweeted the first image of the royal siblings on Saturday night, having earlier described it as "very special". The pictures were taken at their Norfolk home by the Duchess of Cambridge.